Customers use the question, “What do you feed your animals?” as a quick gauge for farming practices. One of the first questions a new customer asks us is, “what do you feed your pigs?” Unlike ruminants, which survive on grass alone, pigs are omnivores and need a more varied diet. The simplest way for pigs to get their protein is to eat hog feed for breakfast, lunch, and dinner, but after years of working with them I’m certain that they enjoy a special menu from time to time. We’ve tried a number of “alternative” food sources, with varying degrees of success. Our greatest accomplishment in this department has been in planting forages for our pigs several times per year. We leverage the predictable Oregon rains to irrigate our fields and grow annual crops of grains, legumes, and other forages. Later, we allow the pigs to self-harvest oats, peas, clover, radishes and whatever else is growing out there. When we open up a new area to them they are visibly excited, running and rooting for treats. But that lasts a few days and then they’re back to the feed trough, where we regularly offer them a no-corn, no-soy hog pellet that is made of wheat, peas, alfalfa, fish meal, and a vitamin/amino acid/probiotic mix to provide those essential nutrients they may not get anywhere else (kind of like iodized salt). We pick up our feed from Union Mills, less than five miles from the farm, in half-ton sacks that we reuse for years (some have been sewed up multiple times). So we have zero packaging waste on our pig food. The pigs love it! Even with a full feed trough, if I forget to give them their “mash” they whine about it and chase me down the fence line until I remember and come back to fill up the mash trough. Unlimited breadsticks! 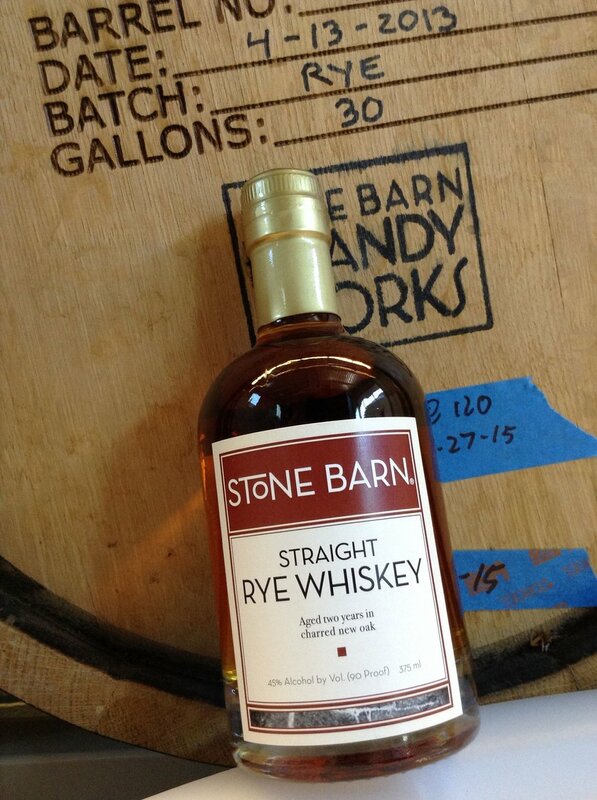 Thanks Stone Barn Brandyworks! Sebastian and Erika Degens focus their products on the terroir of the Pacific Northwest. They source local fruits and grains to make their craft spirits, and are committed to supporting local farmers on both ends of the supply chain! Find them at several local Farmers’ Markets. Even for pigs, variety is the spice of life. Part of the reason why our pork tastes different is because we take the time and spend the money to do things like seeding our fields regularly or driving into town to pick up a few hundred gallons of whiskey mash. This makes our pigs happy and keeps them active, which contributes to a better product. We hope you think so too. Farming is often the art of materials handling. We deal with heavy things (feed, seed, soil amendments, pork) all day, every day, and in the thick of it my back barks like a hungry puppy. To preserve ourselves and ensure a long career in this business, we have to design our systems to minimize wear and tear. I’ve long dreamt of the day we could simply roll heavy things in and out of the back of our truck and trailer with the aid of glorious wheels gliding on smooth concrete. The building is 36’ wide by 24’ feet deep, with one grade height, drive-in door, and two short, pickup truck height loading docks. It’s set into a hill sideways, with the grade height access at the top of the hill. This first bay will protect a tractor or other large machinery, while the middle will be feed, seed, or raw material storage. The third bay will eventually house a walk-in freezer. This is vital for us, as we need to transfer delicate product as quickly and easily as possible during the heat of the summer. We process animals on a rolling schedule, so we’re not only packing coolers for market several times per week, but we’re also picking up meat from our processor and shuffling it around to an off-site storage facility to maintain strict first-in, first-out protocols. Heaving loaded coolers in and out of a pickup truck in July gets old pretty fast. Now we’ll employ a hand truck to make this safer for ourselves and our products. Less important, but still an efficiency we can realize through thoughtful design, is our feed handling. About once every two weeks, we pick up pig feed by the ton from our neighbors at Union Mills Feed. If we fill our own containers (reusable 1000 lb. capacity bags) they offer significant savings (economically and environmentally) over buying the same product in 50 lb. bags. This presents a minor problem for us, because until recently we were tractor-less and thus had no way of unloading these huge bags besides transferring with a bucket (not fun). So we used a small flatbed trailer and simply left the feed on it, covered with a tarp. This worked well for a few years, but meant our valuable feed was exposed to the elements and curious critters, and we never had use of our handy trailer for other projects. With our new shed and truck-height loading dock, we can unload with a simple pallet jack and pick up about twice as much feed per trip. Beyond the joys of the wheel, this transition is important for us. Physically separating farm operations from our home will allow us to better distinguish our business from our family life. We’ll squeeze a desk and coffee machine in our new shed, so we don’t have to take off our muddy boots to come in the house to warm up on a cold day. We’ll move our files out of the guest bedroom and reclaim the garage for (gasp!) parking a car or building a climbing wall for Freddy. Pair with a leafy green salad and finish with a peach cobbler. Any combination of fresh, leafy herbs. I used parsley, basil and mint. You can’t put enough herbs in this. Preheat oven to 325. Toss cherry tomatoes in olive oil and sea salt and roast for 40 mins. The skins should just start to split, but the tomato should still be intact. Combine farro, tomatoes, and all remaining ingredients in a large bowl. Taste. Adjust salt, lemon or oil if it needs any of those things. To grill the sausages, start them over indirect heat, and leave them there until they are cooked through. Then, brown the sausage quickly over direct heat to finish. Let the sausages rest a few minutes before slicing them so you don’t lose all the juices. Plate it up, open a beverage, and enjoy! We’re excited for a new season of farming: full of opportunities, challenges, and rewards. 2017 is going to be a big one for us, as we’re doubling our production and to help manage that growth, Christina is now working full-time on the farm. Woo hoo! So what better time than now to talk in some detail about how we raise our pigs? Not much has changed from last year, we’re still focused on raising happy animals and making the best tasting pork possible. Fortunately those two goals go hand-in-hand! 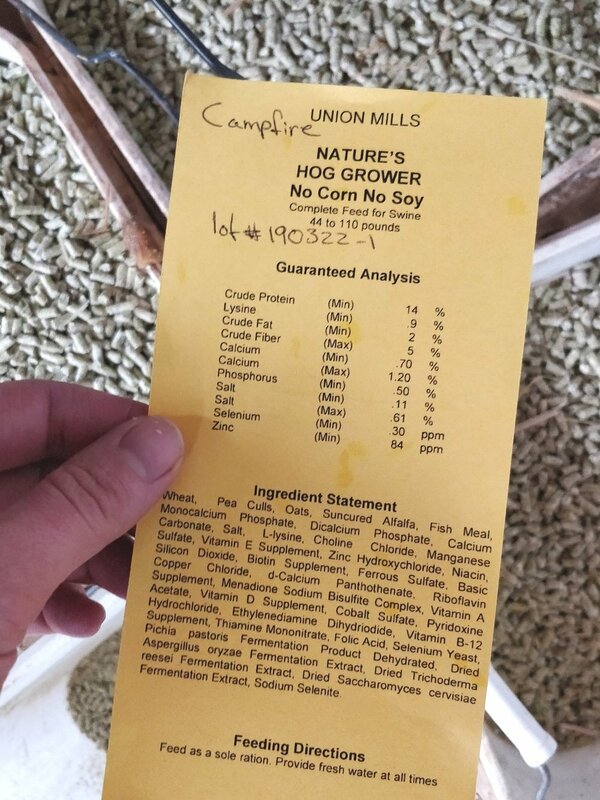 Our pigs get fed a ration of non-GMO grain from our local feed mill (Union Mills Feed, 5 miles from the farm) and pre-consumer food waste (veggies, bread, whey). Pigs grow fast - reaching 280 pounds in 6-8 months and so they eat a lot! One of our goals this year is to reduce the amount of purpose-grown commercial hog food we buy. In a normal system each animal will eat about 1000 pounds of grain to reach market weight. 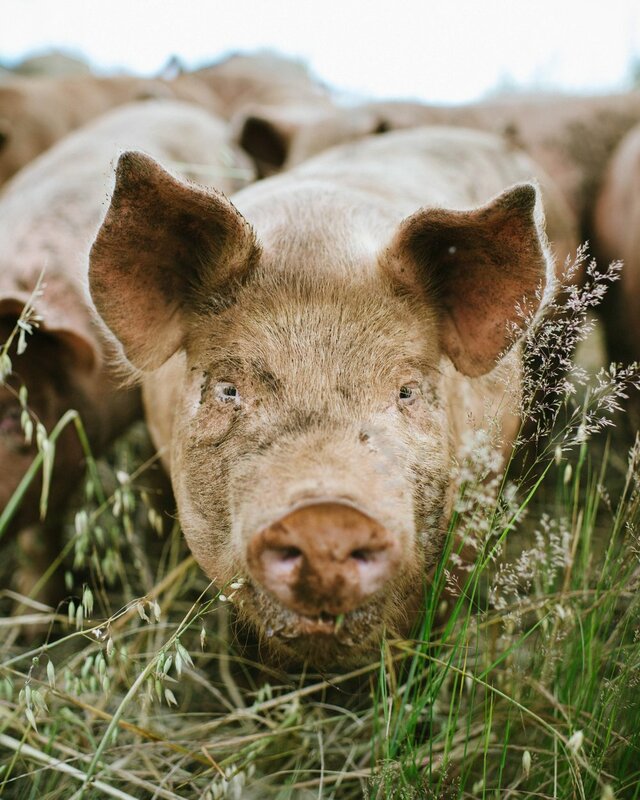 By adding in food waste and turning it back into delicious pork, we’re not only keeping our feed bill down and animals happy but preventing all that food from ending up in a landfill! The most important part of our management system is our frequent moves onto fresh ground. Pigs want to be pigs and explore their surroundings, rooting and searching for buried treasures. They’re also creatures of habit, and if we were to let them loose onto a huge pasture they would create “bathroom” areas that they would use over and over again. Our neighbors wouldn’t be too keen on giant stinking piles of pig poo and more importantly, nasty bacteria and chemicals would leach into our water system. To prevent this we keep them in small groups and give them access to about 2000 square feet of ground at a time, which forces them to spread the manure around the pasture and allows the billions of soil microorganisms to effectively capture its nitrogen, phosphorus, and potassium in the soil for use by future crops. We’ve turned a liability into an asset. This is all well and good, you might be thinking, but where do we get the pigs to begin with? Ultimately it will make sense for us to breed our own piglets and develop genetics that fit best in our system. But at the moment we don’t have the resources (labor, mostly) to do that and so we’ve been buying weaned piglets at 20-30 pounds from some professional breeders in the area. Last year we raised Berkshire/Tamworth crosses. This year, our first group are Yorkshire and Hereford. We like getting pigs that are heritage breeds crossed with conventional breeds, as they are hearty, fast growing, and produce great tasting meat. So we buy them as babies and raise them up, keeping them healthy and as comfortable as possible. At around seven months old they reach market weight and we load them into our livestock trailer and take them to our USDA and Animal Welfare Approved butcher, who processes the animal into retail cuts. We pick up the cuts about a week later and then load them into our freezers back at the farm, where they wait until they head to market or one of our fine local grocers. This summer you’ll find our products at the Milwaukie, Oregon City, and Molalla Farmers Markets, as well as at the Silverton Food Co-op and Grano Bakery & Market in Oregon City. Best wishes to you and your families for a happy and healthy 2017! We’ll see you out there.